Hatters boss Mick Harford insists his side have the temperament to cope with the pressures of the League One promotion race. 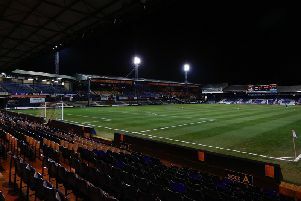 With just eight games to go, Luton find themselves at the top of the table, five points clear of Barnsley and a further seven in front of Sunderland. Although Town have drawn two of their last three matches, letting the lead slip twice against GIllingham on Saturday, Harford doesn’t believe his players are starting to feel the heat in the slightest. He said: “We’re under no pressure at all, everyone’s got to catch us. “We’ve just got to keep performing to a level, try and keep everything as comfortable as possible in terms of relaxing the players, telling the way we want to play, telling them what we’re asking from them. “We don’t put any extra pressure on them, they don’t put any extra pressure on themselves. When asked if thought the first signs of nerves were apparent amongst the players during last weekend's 2-2 draw, after Town were pegged back with just 11 minutes to go, Harford added: "I watched it back on the Monday and I wasn’t as nervous as I was on the Saturday, but you’ve got to give them some credit. "They came and they caused us a few problems, they probably created more chances than any other team since I’ve been in charge have created against us, so we did look slightly vulnerable. "That's one thing we are good at, defending, but you give them a bit of credit. "We’ve done a bit of work this week on defending and attacking, as we do every week, so hopefully we’ll be back to what we should be."